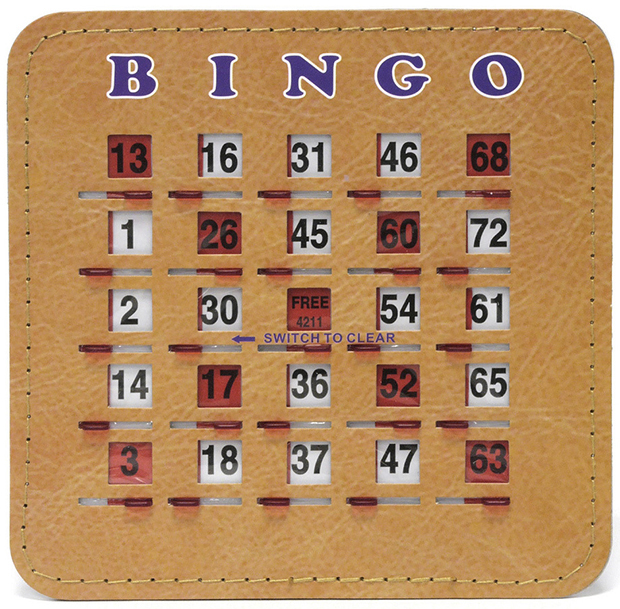 These are deluxe transparent red plastic slide window Senior Friendly Tabbed Quick Clear Stitched 5 Ply Bingo Shutter Slide Cards. A flick of the finger marks the number and are great additions to your bingo event. Extra heavy shutters with large tabbed shutter handles require less effort and dexterity to slide. The quick clear feature allow one movement to clear all the windows for as new game. This card is ideally suited for bus trips, school events, company picnics, family reunions, or other places where you don't want to mess with chips or daubers. Made of extra durable 5-ply stitched cardboard with no duplicate cards.